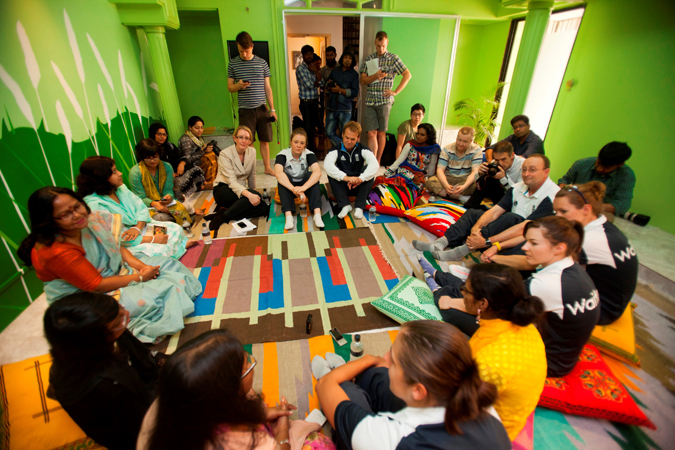 Members of the England women’s cricket team visited the Acid Survivors Foundation (ASF) in Dhaka today (Wednesday 19 March) to see how UK aid has helped thousands of women and children who have been disfigured in acid attacks. Around 3,000 victims of these horrific attacks have been given treatment and support over the past decade, thanks to funding from the UK Department for International Development (DFID). Taking a break from their ICC Women’s World Twenty20 training schedule, the players met with survivors and heard their stories. They also spoke to doctors and medical staff about the issue of violence against women in Bangladesh and how it can often be linked to practices like early, forced marriage. “Today’s visit to the Acid Survivors Foundation hospital in Dhaka has been thought provoking and humbling. The women and children that we met are truly inspirational. The courage that they demonstrate on a daily basis is certainly something that we can all learn from. “I’m really pleased that members of the England women’s team have had the opportunity to visit the Acid Survivors Foundation hospital today. This is a superb programme, which has made a significant difference in reducing the number of acid attacks across Bangladesh in recent years. “When the England men’s team visited the ASF hospital back in 2010, Paul Collingwood was so moved by what he saw that he subsequently became a patron of the charity. I’m sure it was a similarly emotive experience for the players today. “Acid attacks are among the most vicious and damaging forms of violence against women in the world. That is why Britain is supporting the work of the Acid Survivors Foundation, which helps victims and reduces attacks. Justine Greening and members of the England women’s team also attended a reception to celebrate inspirational women at 10 Downing Street earlier this month to help mark International Women’s Day. Captain Charlotte Edwards and Heather Knight met with Prime Minister David Cameron as he announced a summit in July focused on women’s empowerment, and especially tackling early, forced marriage – a major issue for women in Bangladesh. The England women’s team will start their ICC Women’s World Twenty20 campaign on Monday 24 March when they play the West Indies in Sylhet. The DFID-backed Acid Survivors Foundation (ASF) was established in 1999. It provides burn care treatment in a 20 bed hospital free of cost, including reconstructive surgery and psychosocial counselling. It also helps the victims of acid violence to get justice via legal services and runs awareness and lobbying campaigns to help stamp out the practice. Thanks to the efforts of the ASF, attacks in Bangladesh have been drastically reduced. The organisation aims to bring the number down to fewer than 50 per year by 2015. The attacks are predominantly against the poorest and most marginalised women in society. Victims can be further alienated from their communities by the results of the violence – permanent disfigurement and disability. Bottles of sulphuric, hydrochloric and nitric acid are readily available in Bangladesh’s street markets for as little as £1. When it is thrown into a person’s face it melts skin tissue, in some cases dissolving bone and leaving irreparable damage. It can also cause deafness, blindness or damage hands raised in defence. In 2012-2013 DFID’s programme in Bangladesh total spend was £196 million. The ASF has received over £1 million of UK aid from DFID since 2004, through the Manusher Jonno Foundation (MJF), a local Non-Governmental Organisation (NGO) that supports the work of over 100 local NGOs on rights and governance. Under the current phase of MJF’s programme, ASF will receive up to £965,000 over the next three years (2013 - 16). · Lift 1.5 million people out of extreme poverty by providing training or assets like cows to help people set up businesses. · Provide access to improved water sources for 1.3 million more people and improved sanitation for 2.8 million more people. · Help at least 15 million people to cope better with the devastating effects of floods, cyclones and climate change, through access to early warning systems. · Ensure 500,000 girls and boys complete primary education. · Support 500,000 women to give birth safely with skilled carers and improve the quality of care their babies receive. · Help the Government to provide better and more efficient basic services to more people, as well as help increase the number of people who pay taxes to fund these kinds of services.